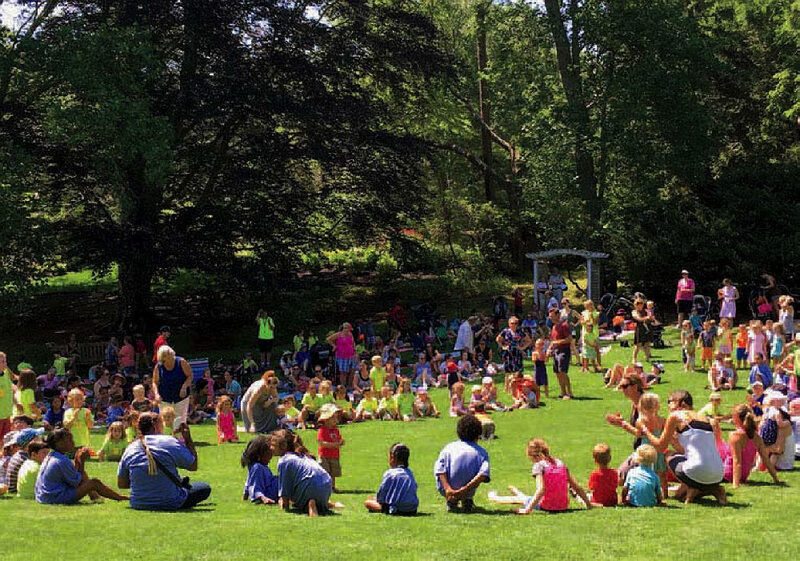 Concerts, games, and family fun take place on lawns and in an amphitheater. Riddle of the day: Where can you find a showroom packed with Indianapolis 500 race cars and a “Hidden Hollow” playground featuring a waterfall and a tree house inspired by medieval churches, along with 800 types of day lilies in bloom and the most comprehensive collection of hydrangeas in the nation? 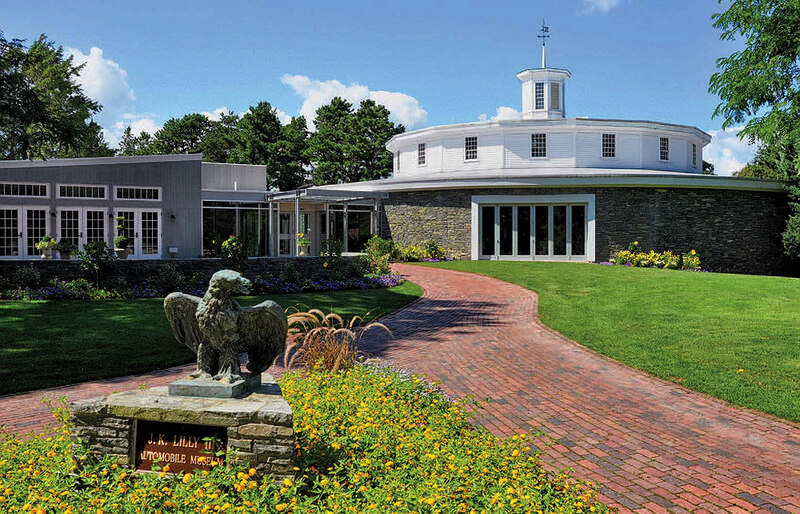 Answer: Heritage Museums and Gardens, in Sandwich, Massachusetts. Not far from the summertime bustle of historic Sandwich, where restaurants and cafés and shops cater to crowds, the museums and gardens sit at the quiet end of a residential road. The property had been a farm, then a horticulturalist’s enclave, when it was bought in 1967 by Josiah Kirby Lilly III (the great-grandson of chemist Eli Lilly, founder of what’s now the eponymous global pharmaceutical giant). Josiah originally developed the museums as a tribute to his father, Josiah Kirby Lilly Jr. (also an Eli Lilly and Company executive), who collected antique firearms and military miniatures. “We have over 6,000 pieces representing every uniform worn by soldiers, from the American Revolution to World War II,” Spear says, as well as “the largest, most complete collection of Elmer Crowell carved bird decoys, and everything that was in his whole [Cape Cod] shop. We have weathervanes, red ware, lots of shop signs, paintings, children’s mugs, a small collection of art glass—and the third-largest collection of Currier and Ives prints.” Rotating selections from that 12,000-object “Heritage Collection” are featured in galleries adjacent to the indoor carousel, built in 1908. Reasoning that the military items might not have wide enough appeal for children and women, Lilly bought that working amusement-park ride with its ornate, hand-carved menagerie in 1971. It was made in the Brooklyn factory founded by master carver Charles Looff, a German immigrant who also created the first carousel at Coney Island. In Sandwich, the colorful figures decked with painted bridles, saddles, and jewels include two goats, a horse and a deer (with real tail hair and antlers, respectively), along with benches called “chariots” that were intended for women in long skirts, all circling a self-playing band organ. The round barn now is packed with 20 iconic Indy 500 vehicles, among which Spear walks and talks, excitedly pointing out the 1911 Stoddard-Dayton pace car driven by speedway developer Carl Fisher during the inaugural race, and the 1925 Miller Special, a single-seater driven by Ralph de Palma (the renowned competitor during the early days of racing amassed 612 laps in 10 Indy 500 races, a record that stood until 1987). There’s also the 1913 Duesenberg driven by future ace fighter pilot (and speedway owner) Eddie Rickenbacker, the 1972 Parnelli VPJ-1 driven by Mario Andretti, and the 2005 Panoz in which Danica Patrick made her Indy 500 debut, qualifying for fourth position. Although the 1951 Chevrolet “First in Line” panel truck, ablaze with more than a hundred racing decals, never rounded the track, it did reliably transport its owner, Lawrence “Larry” Bisceglia, to it. The die-hard fan was an Arizona mechanic who drove to the speedway every year, initially arriving early, and then becoming the official “first in line” record-holder, during the course of nearly six decades. The truck, like all the cars exhibited, are part of the Indianapolis Motor Speedway Hall of Fame Museum. Lilly died in 1995, but would likely have appreciated the race cars, especially because they evoke his hometown, although he and his family long spent summers on Cape Cod, where he was active in philanthropic and civic causes. Other Lilly family members currently serve on the Heritage organization’s board of trustees, which, within the last eight years has expanded Lilly’s original mission. 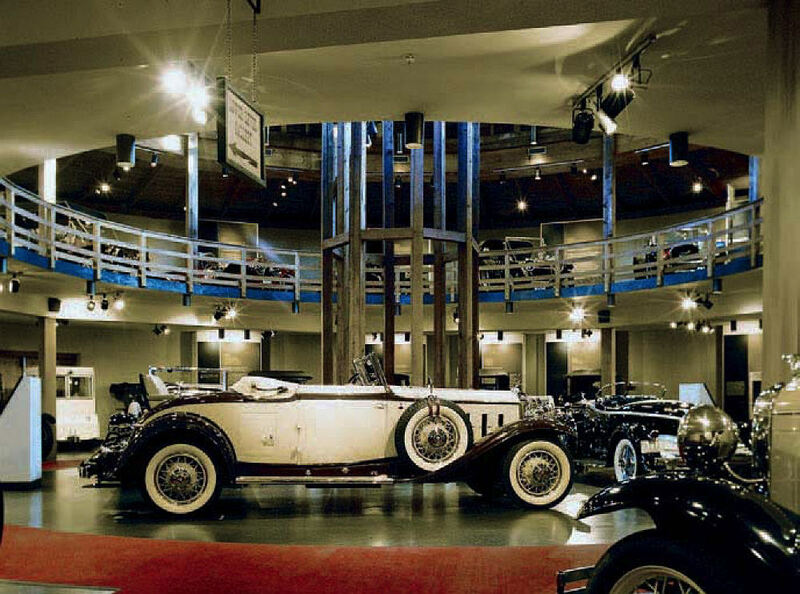 His vision was “of a place for cultural education and exploring American history,” says Spear, “and the automobile collection was a way to examine innovation and engineering and changes in lifestyle in the U.S.A.” wrought by cars. Now, however, the museum’s mission also explicitly includes developing the grounds to better foster “outdoor discovery and excellence in horticultural gardens and landscape design,” she reports. That cars do not jibe with that environmental focus is not lost on Spear, who explains that the mission has evolved over time. And it’s clear the property’s horticultural legacy and illustrious landscape predate the Lilly family, and was cultivated by its previous owner, Charles Owen Dexter. A New Bedford textile manufacturer, Dexter was also a civic leader, photographer, musician, yachtsman, and horticulturist—“a real Renaissance man,” according to Spear. In 1921, he bought the property, then known as Shawme Farm (the land was first settled by European immigrants in 1655), and moved there with his family after his doctor diagnosed him with heart disease and gave him a year to live. “He went on to live 22 more years,” Spear says, with a laugh. In that time, he worked with landscape architect Paul Frost to transform the farm into an arboretum, planting countless specimens and trees, including what’s now the oldest example of a fringe tree (Chionanthus virginicus) in the region. Dexter also became well known for his work hybridizing rhododendrons. He bred for hardiness, bright colors, large blossoms, and fragrance, and, at his peak, produced more than 10,000 new seedlings a year. Today, Heritage Museums & Gardens holds about 160 varieties of rhododendrons named for Dexter and for estate superintendent J.C. Cowles—and thousands of unnamed varieties. They bloom from mid May to mid June, blanketing the grounds with white, pink, and fuchsia blossoms, although the pathways that snake through and around the towering specimens, many more than 90 years old, are wonderful to stroll at any season. The grounds also boast more than 5,000 other documented plant species, ranging from Cape Cod’s native flora to exotic plants and trees (most of them labeled) along two miles of walking trails. The main path begins at the entrance and parallels an ornamental flume, built in 2010, through which water flows before dropping26 feet into a pond where varieties of water lilies bloom throughout the summer. 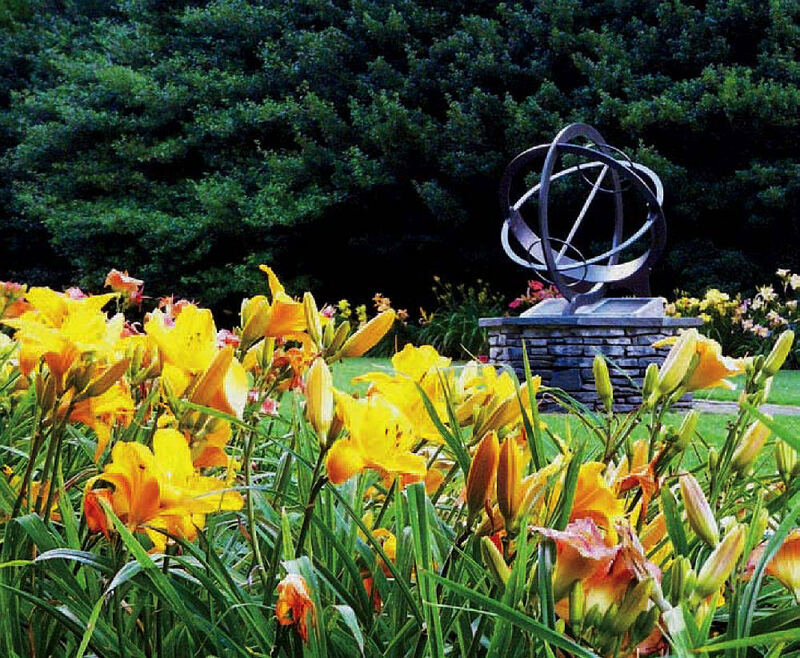 The path continues on to the Sundial Garden, where 800 cultivars of daylilies bloom from late spring through the summer, peaking in early July. 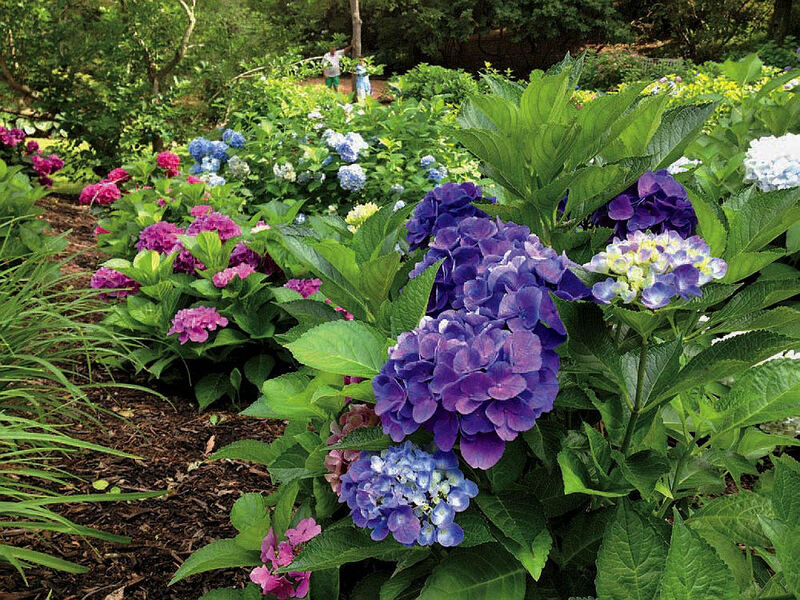 Beyond lies one of the newest aspects of the organization’s gardening mission: the North American Hydrangea Test Garden and the Cape Cod Hydrangea Garden, which include an estimated 155 species and cultivars. From early July through the end of September, these rounded, big-leafed bushes are aglow with flowers, in a spectrum of hues from white to pinkish violets and blues. The paradisical Hidden Hollow features water play and a three-tiered tree house. Toward one end of the property is Hidden Hollow. A favorite oasis of kids and adults alike, this two-acre playground features natural materials—rocks, branches, water, and plants, along with a child-scaled waterfall, water-pumping station, and fort-building zone to help foster STEM-related curiosity and experimentation. In the corner, the charming three-tiered tree house by renowned designer Pete Nelson was inspired by Norse stave churches, and then built by students at the Upper Cape Cod Regional Technical School.